Bishop Noriaki Ito was born as the first son of Rev. Horyu and Kazuko Ito in Kumamoto, Japan in September, 1948. He came to the United States with his family in April, 1955, settling in the Boyle Heights area of Los Angeles where his father was serving as Rinban (head minister) of the Los Angeles Higashi Honganji Betsuin (regional headquarters temple). He received his elementary and secondary education in East Los Angeles, graduating from Roosevelt High School in January, 1967. In September of that year, he enrolled at Occidental College in Los Angeles. In June, 1971, he graduated with a Bachelor of Arts degree in Religious Studies with a minor in Asian Studies. Following his graduation, he moved to Kyoto, Japan in September, 1971 to enroll at Otani University. In December of that year, he received initial ordination at the Higashi Honganji headquarters. In March of 1975, he completed his studies, receiving a Master of Arts degree in Shin Buddhism. Concurrently, he completed all of the requirements for full ordination, being given the title of Kyoshi (teaching priest). Leaving Kyoto, Noriaki departed on a three-month tour of India and other parts of Asia, the Middle East and Europe. With his orders from headquarters to serve as an overseas minister (Kaikyoshi), he began his duties as a full-time minister at the Higashi Honganji Los Angeles Buddhist Temple in September, 1975. In November, 1979, he took a leave of absence from the temple to undertake further language study in Tokyo, Japan. He returned to Los Angeles in November, 1982 to resume his position as minister at the temple. In June, 1988, he was transferred to the West Covina Higashi Honganji to serve as resident minister. In November, 1993, in conjunction with the 90th Anniversary of the Higashi Honganji North America District, he returned to the Los Angeles Betsuin to assume the position of Rinban (head minister of a regional headquarters temple). On December 3, 2006, Rinban Ito was honored for 30 years of continuous service as a Higashi Honganji minister. 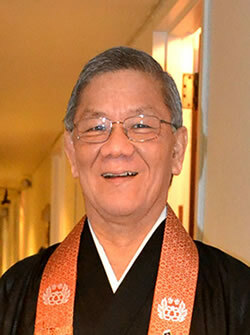 In January, 2011, Rinban Ito was appointed Bishop of the Higashi Honganji North America District and will concurrently serve as Rinban of the Los Angeles Headquarters Temple. He also serves as the Buddhist advisor at Occidental College. Rev. Ito currently resides in La Crescenta, California. He is married and has three children. Rev. 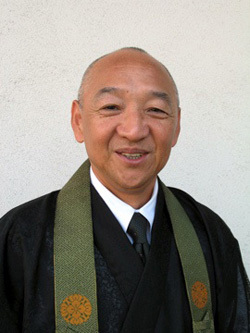 Peter Hata’s interest in Buddhism began as an active lay member of West Covina Buddhist Temple, where he has been the temple’s Gateway Newsletter editor and manager of their livingdharma.org website for many years. In 2009 he completed Minister’s Assistant training, received Tokudo ordination in 2011 and, in 2012, received Kyoshi ordination. In the fall of 2012, he received Kaikyoshi status and was appointed resident minister of West Covina Buddhist Temple. Rev. Peter is also a musician and is an original member of the jazz-fusion group Hiroshima, with whom he played guitar, toured the U.S.A and Japan, and recorded four albums in the 1970s and 80s. Later, he left the group to pursue the more traditional jazz styles, which led to his writing a book entitled, Speaking Jazz: The Natural Way to Jazz Improvisation. In 2006, he earned his Master of Music degree from Cal State LA and, upon graduating, was invited by the university’s music department to become a faculty member and has taught a wide variety of graduate and undergraduate music courses there. He also performs locally with his own jazz trio and has directed the Lotus and Bodhi Tree youth bands, and the Dharmatones adult choir at the temple. Beginning in February of 2014, Rev. Peter was reassigned as staff minister at the Los Angeles Betsuin, beginning yet another new chapter of his life. He brings with him a wide variety of interests, including Buddhist chanting music and the dynamic interaction between Shin Buddhism and our American cultural and intellectual traditions.